Posted October 1, 2016 by Cate & filed under News. 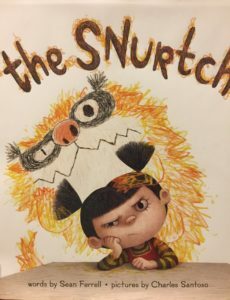 The Snurtch by Sean Ferrell, Illustrations by Charles Santoso. Atheneum Books/2016. I refuse to pick My Favorite Picture Book of 2016. There are too many astonishing books out there. You can’t make me pick just one! Oops. That wasn’t me getting mad. It was the Snurtch. So it goes in Sean Ferrell’s new picture book The Snurtch, illustrated by Charles Santoso (Atheneum/2016). The concept is funny and convincing. Ruthie has a problem. She has a Snurtch. It is not Nice. It is “scribbly and scrunchy, grabby, burpy and rude” in school. But she didn’t crumple up George’s drawing! It was the Snurtch. He did it. Whyyyyyy do I have to pick just one, book? Uuuuuhg, it’s so annoyyyying. I’ll show you, little lady, how to beat anger and never have it run your life again. Ferrell and Santoso don’t stumble into either of these traps. Instead, I suspect kids feel empowered watching the Snurtch. He throws fits! He grabs stuff! He gets her in trouble! That naughty Snurtch just takes over. Which if you stop to think about it, is exactly how anger feels when you’re a little kid. Or, ahem, possibly a grown up? I was struck by the easy-breezy volleying between Ferrell’s text and Santoso’s illustrations. Ferrell sets things up with this nice snippet of economic text,”The Snurch is a lot of things. Nice is not one of them.” And Santoso answers back in specifics, filling the page with numerous, hilarious examples. Other times, Ferrell keeps the details in the text, “Ruthie tries to draw something pretty. Or cute. Or happy. But all that comes out of her crayon is unhappy scribbles,” and Santoso adds onto the words seamlessly. Back and forth it goes. They build fluidity throughout the book like a great duet. The Snurtch pulls off being funny and touching all at once—a hard thing to do! Ask any picture book writer to show you their gray hairs trying to pull this off. The nuances of Ruthie’s facial expressions as she stares down her Snurtch are side-splitting. And when she bravely shares her Snurtch drawing with the entire class, we read,”No one is more surprised than Ruthie when she stands up.” I have to admit, it (almost) thawed my heart of stone. But perhaps the most poignant, and dare I say— magical?, moment happens on the last page. We the reader see the entire classroom filled with busy children, each with their own Snurtch, working right beside them. Thank goodness we all have a Snurtch. Now go read it before I get angry. Ready for the rest of our 2016 recommendations? Just follow the links!